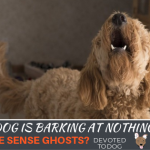 Home / Behaviors / Your Dog is Barking at Nothing – Can She Sense Ghosts? We depend on our dogs to use their superior senses of smell and hearing to let us know about things we may not be able to detect. Your dog is probably the first one in the household to notice that someone has arrived in the driveway or that a package has been left on the front steps. Usually, if your dog starts barking suddenly, there is a good reason. 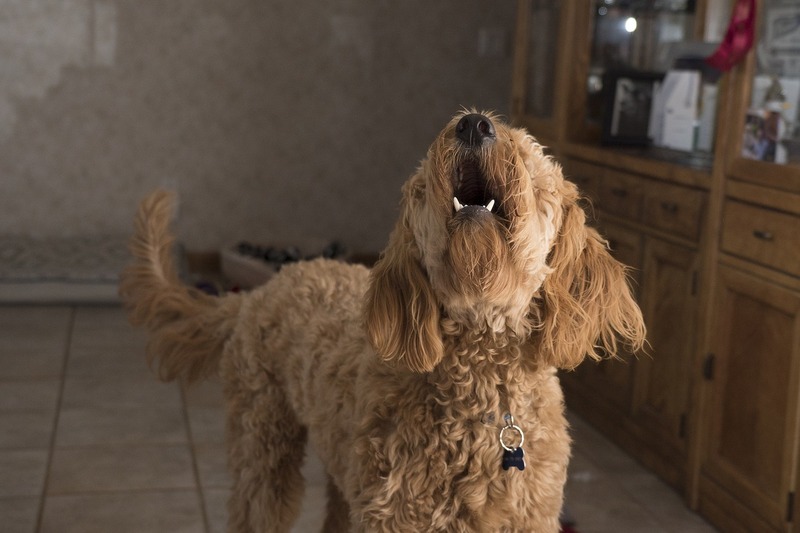 If your dog is barking inexplicably, especially if the barking is continuous or at night, it can be incredibly frustrating and even a bit unnerving. Is your house haunted? What is your dog barking at all the time? Don’t be too quick to lose your temper or call the ghostbusters. There are things that you can do to make the random barking stop and help your dog to be calm. If your dog is barking at nothing, don’t lose hope. By figuring out what your dog is really barking at and why, you can work towards finding a solution. A combination of understanding and training can provide a solution for you and your dog no matter why your dog is barking. Your dog has much better hearing and smell than you do, and dogs are also more aware of changes in barometric pressure than humans. Your dog may be responding to a new wild animal hanging around your house, or possibly even something more sinister, like a person sneaking around the property. It is also possible that your dog is aware of a thunderstorm coming that you can’t yet hear. To identify whether your dog is really aware of something that you can’t see, pay attention to the circumstances and behavior. What are the Circumstances Around the Barking? Is there often a thunderstorm soon after your dog randomly barked? If so, the chances are good that the barking is prompted by the coming storm. Does your dog usually bark at about the same time of day or night? Pay attention to what goes on every day about the time your dog barks. Does the same person walk by, perhaps with a dog? Does a neighbor arrive home from work? Does the local church bell chime at midnight? You may be able to identify why your dog is barking by connecting the behavior to a repetitive stimulus. If your dog is barking out windows and doors, and especially if she seems to be tracking something by tilting her head and sniffing the air, she is more likely to be barking at something real. If you let her out on a lead, what does she do? If she drags you around with her nose to the ground or intensifies barking with a focus in one direction, it is even more likely that an animal or person around your property is causing the behavior. 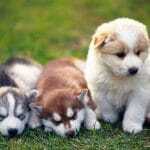 If, however, your dog is uninterested once she gets outside, it is less likely that barking is based on anything real. If your dog is barking at something real, and you would rather she wouldn’t, you can teach her that while barking is an appropriate way to draw your attention to a potential threat, once you are alerted, the barking can stop. To teach your dog this, react to her barking by checking out the window or door, and telling her “Thank you” or another command to indicate that you have assessed the threat and handled it. As soon as your dog goes quiet, reward her with a treat or favorite toy. Just because your dog has some senses that are superior to yours doesn’t mean that she is always right about what she hears or smells. Your dog may be incorrect in thinking there is something to bark about for several reasons. Your dog may sometimes not realize that the sounds coming from a TV, computer, or smartphone are not real. Especially if sounds are of animals, in particular other dogs, your dog may respond as if the stimulus was really right in the room. You may not realize that your dog is responding to a sound from the TV or your phone because she may not normally react to these sounds. You may not realize what specific sound triggered a reaction among the range of sounds coming from media devices in your home. If your dog is barking without a clear direction, and seems a bit confused and hesitant, it is very possible that this is the cause. Try replaying whatever media you were listening to to see if your dog responds by barking again. As dogs age, they can develop symptoms of dementia, just like people. Dogs that are developing dementia may be confused, change routines without reason, get lost in familiar places, and sometimes, bark at nothing. Your vet can help to diagnose dementia, and there are medications that can help, so if your aging dog is barking for no reason, it is a good idea to take her to the vet so that you can determine if dementia might be the cause. If you see other indications of dementia like confusion and sundowners syndrome, in which your dog won’t settle down in the evening, there is a good chance that dementia is also to blame for random barking. Some dogs experience neurologic conditions in which they see things that aren’t there. This can often result in “fly biting”, in which a dog will snap at the air, focusing on a space in front of their face where in fact there is nothing. Dogs that see things that aren’t there may also bark at what they see, as well as snapping at the stimulus. If your dog is barking at things that aren’t there, your best bet for controlling the behavior, aside from medication prescribed by your veterinarian, is to teach your dog another way of handling the stimulus. If you know what is prompting the barking, like sounds from your TV, you can play the sounds and reward your dog for remaining calm and quiet. If you don’t know why your dog is barking, you can still teach her not to. When your dog barks, tell her “quiet” or another command. As soon as she is quiet, even momentarily, give her a treat. It can help to teach your dog to bark with a command like “speak”, so that you can do practice drills between asking your dog to bark and asking her to be quiet. Once your dog understands what “quiet” means, and that being quiet will bring great treats or chews, she will remain quiet even if she is still feeling the impulse to bark. Maybe your dog really is barking at something, but once you figure out what it is, you can’t believe that that is what your dog was going on about. Your dog may be barking at a squirrel or bird out the window, or even a beam of light moving across the floor or walls of the room. Bored dogs often find their own way to do something important, and that might be alerting you to every little change in the environment. Some dogs will even bark at a chair that has been moved a few inches from its usual position. Your dog may also be reacting to other dogs in the neighborhood that are barking. 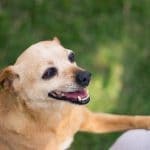 While some dogs are simply more sensitive and reactive than others, there are certainly things that you can do to help your little drama queen stop making a big deal out of everything. If you realize that your dog is focusing on an everyday or arbitrary stimulus and that this is why she is barking randomly, there is a good chance that your dog needs more mental stimulus. Providing your dog with puzzle food dispensing toys, good chews, and games like “Find the treat” is a good way to give that active brain something to do besides track every tiny detail of her environment. Such dogs are also likely to benefit from plenty of physical exercise, since a tired dog is less likely to care whether the sun is moving across the wall or not. If your dog is barking at you, chances are she isn’t barking for any reason other than to get your attention. It is especially clear if she stops or intensifies barking when you look at her. Barks for attention are usually continuous intense yips, as if your dog simply can’t contain herself, or halting barks, as your dog watches for your reaction between barks. If your dog is staring at your face while barking, however, the chances are extremely good that she wants your attention. If you pick up a toy or leash and your dog does a happy dance, you will know what she was asking for. Your dog may also be telling you that she needs to go out or that dinner time is near. No matter what your dog is trying to say, it is important that you pay attention to her communication. Dogs are generally pretty willing to go with the flow, so if your dog is demanding something, chances are it is something that she really feels she needs. You can’t always give your dog attention when she wants it, so what do you do? You can teach your dog to wait until you are ready to give her what she needs, but be aware that if your dog is already asking and you make her wait longer, the likelihood that she will get into some trouble increases. Your bored dog might destroy something or develop bad habits without the attention she needs. Give your dog the mental and physical exercise that she needs in order to prevent the boredom and frustration that might lead to barking to get your attention, as well as behavioral problems. If your dog needs more exercise than you can handle, especially in very hot or cold weather, you can consider getting her a treadmill to wear off excess energy without consuming too much of your time. Most dogs learn to love running on a treadmill and even ask for it with plenty of positive reinforcement. Food dispensing puzzle toys, chew toys, and puzzle games can also help to entertain your dog’s mind. High drive dogs that demand a lot of your attention benefit from advanced obedience training, agility training, and other disciplines that exhaust their considerable mental and physical resources. To ask your dog to wait, tell her “wait”, then give her a good chew or food toy when she achieves a calm state. Increase the time your dog waits for the reward until you can ask her to wait for some time. If none of these explanations seem to apply to your dog, you may really be ready to call the ghostbusters after dealing with your dog’s random barking for some time. Dogs have long been said to have senses that exceed our own in more ways than hearing and smell. Who’s to say what your dog might be able to sense? Perhaps your house really is haunted. Aside from calling a ghost detection company, there are things that you can do to train your dog not to bark at whatever she is barking at. Teach your dog “Quiet” and “Speak” in the way described under the Doggie Dementia and Neurologic Symptoms section. Even if your dog still believes that she has reason to bark, she can learn to resist the urge for a tasty treat or favorite toy. Having a dog that is barking at nothing can be extremely frustrating, but don’t lose hope. You can teach your dog not to bark no matter what is causing the behavior. Take the time to identify why your dog is barking and meet her needs as well as teaching obedience commands centered around “speak” and “quiet”, and soon constant random barking will be a problem of the past.